Wash zucchini. Trim ends and cut each in half lengthwise. Use a spoon to gently scrape out soft, seedy center of zucchini. Place zucchini halves in a small baking dish. Spoon pasta sauce into zucchini halves. Top with mozzarella and parmesan cheeses. 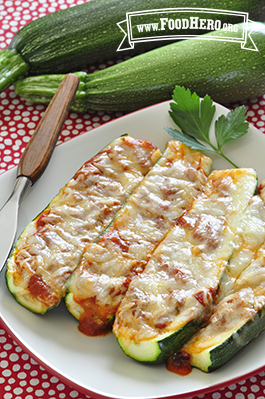 Bake for 25 to 30 minutes or until zucchini can be pierced with a fork and cheese is bubbly and brown. Serve warm.